(Dan Trimmer, 2002). Tetraploid (Rodeo Sweetheart x Sabine Baur) 21” EM Re Ev 4 ½” A dramatic huge cranberry red eye and edge dominate the face of this bloom. On rebloom the eye and edge can be so big sometimes there is only a small sliver of peach petal exposed. 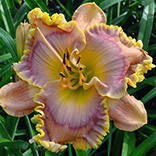 Again, on rebloom the edge also can show small cranberry colored teeth and a wire of gold on the petal edge. 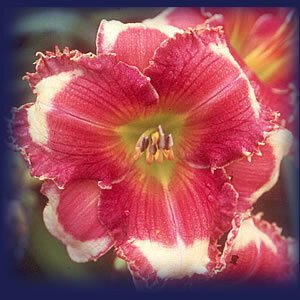 Well branched with a bud count of 25-30, extremely fertile, and a superb parent CALLING ALL ANGELS imparts a unique and sophisticated look to its offspring.